Introduced yesterday at the Barclay Center in Brooklyn, the Samsung Galaxy Note9 “phablet” gives Note fans multiple reasons to upgrade. The Galaxy Note9 boasts notable improvements in battery life, storage capacity and connectivity, gets clever camera and S-Pen upgrades and sports a gorgeous 6.4-inch display. We went hands-on to give you our first impressions of the new flagship phone. The 6.4-inch Note9 arrives in a case that’s just a minuscule .2 mm thicker than the Note8 - 8.8 mm vs 8.6 mm. 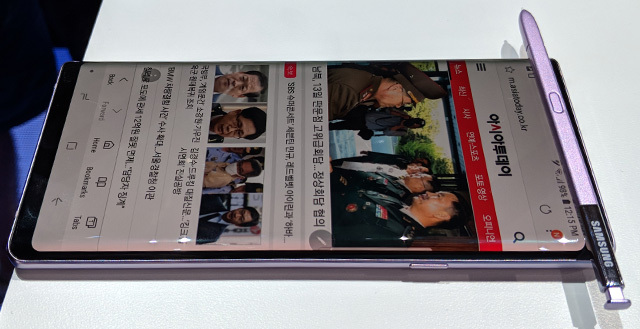 The Note9 is also barely wider, 76.4mm versus 74.8mm, and actually a tad shorter - 161.9mm versus 162.5mm for its predecessor. 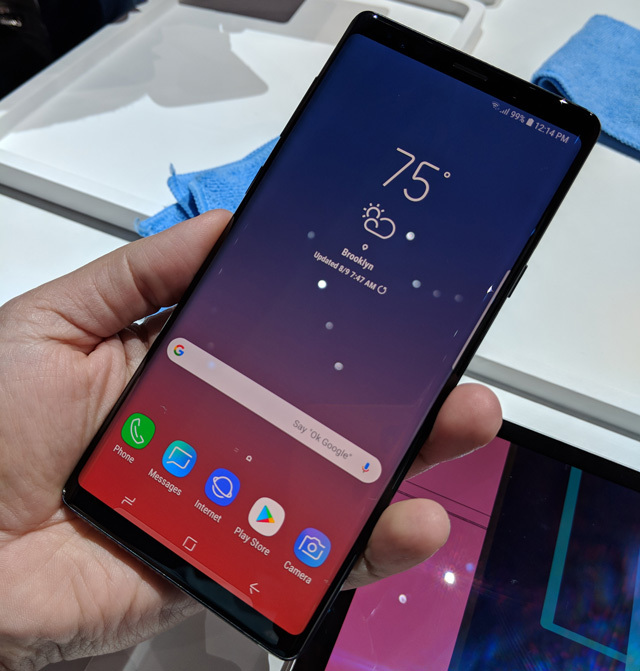 First tactile impressions are quite positive, as the Note9 is living large with that “Infinity” (edge-to-edge), super bright Quad+ Super AMOLED screen packing 516 pixels per inch (2960 by 1440 pixel resolution) in a pretty package which still feels comfortable in a smaller-sized hand. And the phone stands apart (again!) with new metallic color case options: Ocean Blue and Lavender Purple. Midnight Black and Metallic Copper may come to the U.S. later. The smartphone back packs a fingerprint detection pad, which was moved north for easier use than its predecessor. Samsung’s S-Pen, a Note’s best on-board screen writing/drawing/controlling pal, has also been upgraded. Now a mere one minute of recharge time enables 30 minutes of usage. And the slender stylus newly boasts Bluetooth Low-Energy support. So, you can tap its trigger button from as much as 30 feet away to take a selfie or group shot, or cue a power point presentation, or start and stop the music. Hardly just another Selfie trigger bulb, this remote works in tandem with advanced Artificial Intelligence capabilities built into the Note9’s picture processing system. Eliciting some of the biggest response from the 3,000 strong attendees at the Samsung Unpacked event was a feature called Scene Optimizer. Working from a memory bank of 20 image “types,” it senses if you’re shooting into the sun or at night, towards a concert stage or an artfully “plated” pile of food, and smartly adjusts the saturation, white balance, brightness and contrast accordingly. Even cooler – Flaw Detection warns if the lens is smudged or the subject has blinked, encouraging a do-over before the moment’s passed and the gang’s dispersed. The camera is actually two 12 MP cameras — one wide and one telephoto — with optical image stabilization. The wide-angle lens features Samsung’s interesting Dual Aperture setting (user switchable to f.1.5 or f. 2.4) to manually play with depth of field and lighting conditions. 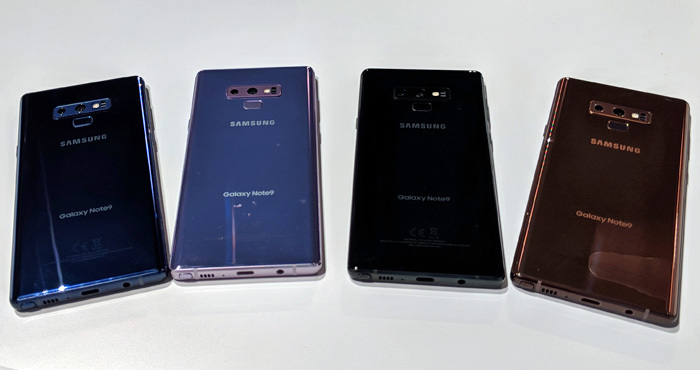 The standard issue Note9 offers 126 GB of internal memory, twice that of its predecessor, while a 512 GB version is optional at $1,249.99. Users can then pump up total storage capacity to a whopping Terabyte by installing a new (Fall release) Samsung 512 GB microSD card engineered for compatibility. Loading the thing with content should be as quick as your source allows, as data can pour in at up to 1.2 gigabits per second. Thank the cutting edge 10nm 64-bit Octa-core processor. The Note9 totes a significantly upgraded 4,000 mAh battery – up from 3300 in the 6.3-inch Note8 and 500-1000 mAh better than are found in the current Galaxy S9+ and basic S9, respectively. 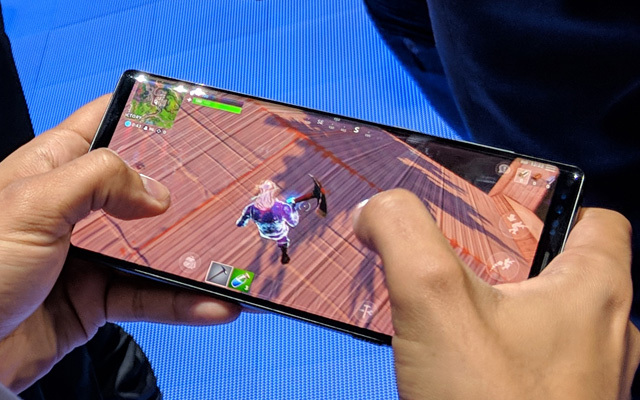 That faster processor and awesome screen make the Note9 perfect for gaming too. And to highlight this fact, Epic Games, in its launch of Fortnite for the Android platform, is offering an “exclusive” (for the first, ridiculously brief 48 hours) to Galaxy users. Movies and music (including a newly cemented, device-spanning hookup of Samsung with Spotify) are also being served with the “loudest ever” (claimed an exec) stereo speakers placed in a Samsung phone. Note9’s sound system is tweaked by the AKG division and will support Dolby Atmos - most likely with virtual surround for headphones wearers. The Samsung Galaxy Note9 hits stores beginning August 24 at $999.99 with pre-orders starting now. But you don't have to pay full price. There are deals out there. For instance, Sprint is offering 50 percent off if you get the Note9 with their Flex Lease, which comes to approximately $21 per month. So be sure to check for deals with your carrier.